Rural countryside meets urban city styling with this Lancaster Table & Seating antique walnut solid wood live edge bar height table. Coming with an attractive table top and compatible bar height base, this set provides you with everything you need to set up and complete the look of your dining area. It's sure to add a rustic element with contemporary flair to your restaurant, bistro, or bar! The eye-catching table top is accented and supported by the included table base. It features a matching solid wood post with a metal base plate and spider attachment. 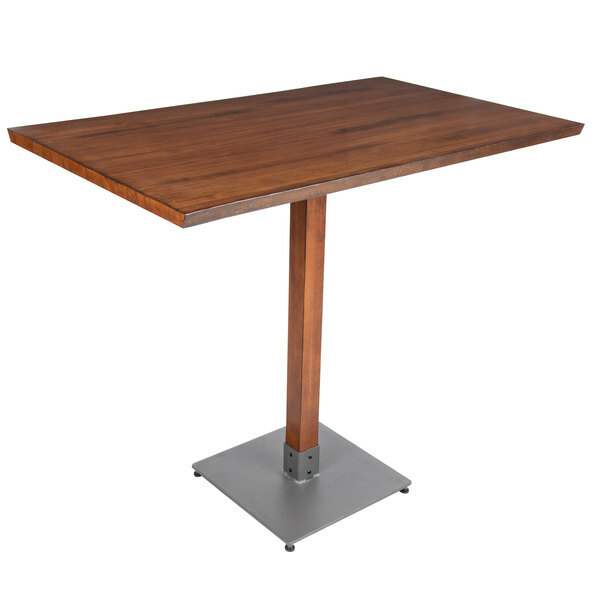 While the wide, square base plate helps to prevent the table from wobbling, the 200 lb. weight capacity guarantees it will hold a compatible tabletop. Plus, the entire set comes unassembled to save you on shipping costs. This Lancaster Table & Seating dining table meshes the warm, natural look of wood with rugged, metal components for a vintage yet trendy, industrialized appearance that your guests are sure to love! Table Top Thickness: 1 1/4"